Girl Online follows Penny, your average unlucky and a bit clumsy teen, on a family trip to New York after things go from bad to worse with her 'friends'. Penny struggles with anxiety and panic attacks and uses her online blog, 'girl online', as a way to vent her emotions and create an online community to support each other in similar circumstances. While in New York, Penny meets Noah who seems almost too perfect to be true and the love story spirals from there. I'm sure from that summary you can see just how stereotypical young teen romance this book is. I really wanted to like this book as, while I'm not necessarily an active 'fan' of Zoe's, I do watch her videos and read her blog. I purposely left it a while before reading it to allow the controversy involving her use of a ghostwriter to die down a bit so I could read it with an open mind. The way I viewed it was Zoe still had some role in the book and she is certainly not the first celebrity to use a ghostwriter, so I personally felt the attack she got as a result was unfair. Zoe clearly did have some undeniable role in this book as Penny holds a startling amount of parallels to Zoe herself. Many (if not all) of the tips she talks about for dealing with anxiety or panic attacks are ones that have been shared by Zoe in some form over the last few years and one of the 'blog posts' in the book in particular reminded me a lot of one Zoe has published in the past. Zoe's stamp is definitely on the book and it does, without a doubt, fit with the Zoella brand in terms of subject matter and the way it deals with topics like this. That being said, from reading the 2 page acknowledgements at the end of the book it becomes highly questionable whether Zoe actually physically sat down and wrote any of the book. 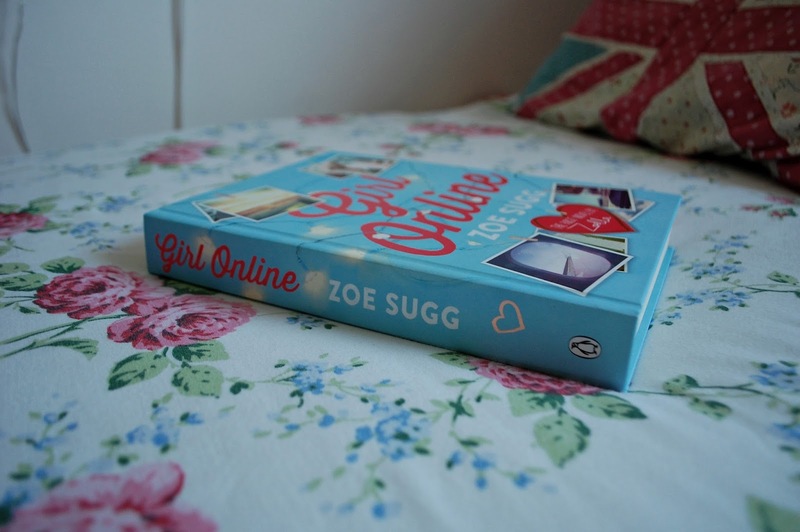 The writing in Girl Online does not read even remotely in the same way Zoe's writing does. Zoe has a unique voice when she writes, which I personally found was one of the reasons I first started reading her blog, and that just isn't there in Girl Online. It frustrates me that Zoe Sugg is a good writer and I fully believe she is capable of writing a book, yet a book was published that wasn't written by her and her name was stamped on it instead of allowing her to write it herself. With the issue of who wrote the book aside, I'd like to discuss the book itself. I'm going to be brutally honest here: I do not think this is a good book and it does not fit the age group Zoe and the publishers have stated it was aimed at. The stated age group is 12-16 year olds, meaning, as an 18 year old, I shouldn't have felt like I was reading a book aimed at people way younger than myself. It felt like I should've been reading it at the same time as I was in love with Jacqueline Wilson, which would've been when I was around the age of 8-10. The voice of Penny which narrates the novel sounds less like a 16 year old, more like a 13 year old and because of that it seemed odd that the team behind the book feel it should be aimed at people up to the age of 16. John Green has often stated that teenagers are not given enough credit by publishers etc and that they are more intelligent than they are assumed to be. While John writes his books fully aware of not patronising his audience, it felt like Girl Online did the opposite. In addition to this, the plot was so stereotypical and predictable that I could've told you what would happen in the next chapter for the entirety of the book. It's a very standard love story with one thing added, that Penny runs a blog. Other than that, it's the same thing that has been published hundreds of times before (often better). There were also several moments where I had major issues with the book and I've decided to share two examples with you. Since I had issues with both some of the ideas/areas of the plot and some of the grammar used, I've picked out one of each. The idea I have an issue with: When she sees her in a 1920s style flapper dress, Sadie Lee (Noah's grandmother) says to Penny 'You look just like a picture I have at home of my grandmother. She was one of the original flapper girls.' This means Noah's Great, Great-Grandmother was one of the original flapper girls. My issue I have with this is that it relies heavily on all of the generations between his Great, Great-Grandmother and himself having had children fairly young. I know that my Great-Grandfather was the right age to fight in World War 2, and for Sadie Lee's Grandmother to have been one of the 'original flapper girls', she would've had to be late teens-late 20s during the 1920s. While it is plausible when the argument is made that everyone between Noah and his Great, Great-Grandmother could've had children during their late teens-very early 20s, it would have made it much more believable had she said her mother instead of grandmother. This might sound like a tiny point to pick up on but as someone extremely passionate about history I feel we often think of it as more distant than it actually was, which is exactly what this comment does, for no reason. The sentence I have issues with the grammar of: Towards the end of the book this sentence pops up: 'Do you want to come here and I'll show it to you if you like?' There are so many extra words in that sentence that make the poor grammar stick out like a sore thumb. While I know some people would argue that mistakes are made in books all the time and that's just something that needs to be looked past, there were too many in this book for me to do that. Penguin are the largest publishing house in the UK and it was fairly obvious to everyone that this book was going to sell a ridiculous number of copies regardless of whether it was good or not which makes me angry that they didn't check it more carefully before putting it out into the world. There are people whose job it is to proof-read books, particularly for spelling and grammar errors, before they are published, so why did so many mistakes fall through this net? I think it speaks volumes that I, someone who hates writing in books or marking them in any way, could not stop myself from writing little sarcastic comments in pencil at various points in the book, something which has never happened before. You may ask why I gave it 2 stars and that's because the concept was generally promising and there were, believe it or not, moments in the book I did enjoy. They were just few and far between. For example, while I liked the character of Elliot, the way he is basically forgotten about fairly often is something which annoyed me, meaning the initial positive was turned into a negative. If this was an average book, I would be able to deal with the issues it has. What I can't deal with is the amount of copies this sold and records it broke for such a painfully average (if not below average) book. Have you read Girl Online? Do you think I'm being unfair and should just ignore its issues? Did you also find the issues in it too much? Let me know in the comments, I'd really love to have a discussion about it. I feel like writers have to write at the level audiences can handle, maybe the writing style was appropriate for the age group of the book, who knows? Very thoughtful! so, I am running the Book Blog awards this year for the 2nd year in a row and wanted to let you know nominations are open until October 31st . There are 15 awards up for grabs this year. You may nominate your own blog or ask your readers to nominate you. Readers vote on November 15th.